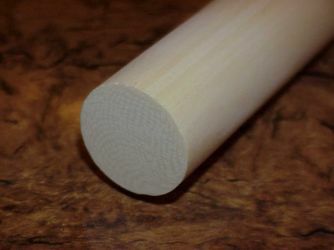 Resin-Ivory™ Top grade Imitation ivory for cue stick joints. Resin-Ivory+S™ is the highest quality imitation ivory we have seen,worked or handled - ever. Arvorin and other alternative ivories are made as a spun polyester but Resin Ivory™ is a resin based material that has greater strength and better properties for cue stick making. The others will shatter when dropped on the floor - Resin Ivory will not. This Resin-Ivory+S™ S grade has the Shreger lines in the end grain - hence the +S designation. The Shreger lines are those forming the herringbone pattern as seen in the end grain view of real ivory. The lengthwise grain of the S grade has a quarter sawn ivory look to it as well. Glues to wood with white glue and to other materials with super glue or epoxy. Does not chip if using new or newly sharpened tools. Resin-Ivory+S™ S Grade Cue Ferrule Rod 14mm Dia. (9/16") by 6"
14 mm (9/16 inch) round by 6 inch length. Click on Photo for info. Overseas Customers please email for shipping costs. Resin-Ivory+S™ S Grade Rod 26mm Dia. (1") by 6"
26 mm (1 inch) round by 6 inch length.